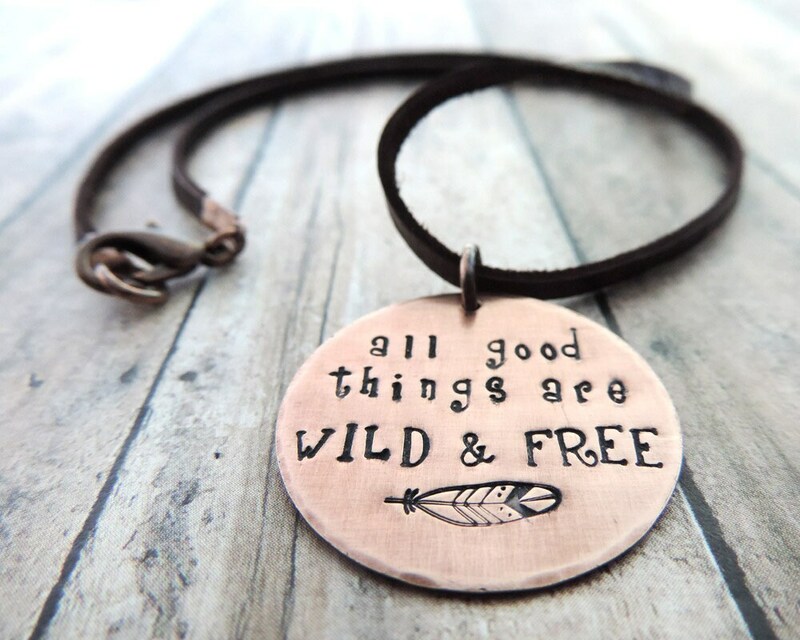 These words from Henry David Thoreau, "all good things are wild and free," remind us that many of the good things in life are free. Friends, family, love, happiness, fresh air, sunshine, and nature just to name a few. NOTE TO INTERNATIONAL BUYERS: You may be responsible for additional fees in the form of import taxes and/or customs duty. These fees vary by country and will be collected prior to delivery of your package. I really loved the other items on this website and inquired about a custom saying and change in metals for the pendant. Gayle was very responsive, She made suggestions, and I love the final product! Very quick turnaround time, which was great, because this was a gift. Thanks again. LOVE the Pendant and necklace. Gayle was wonderful to work with, allowing me to make some changes to this necklace, and I cannot be more happy with the results. Thank you so much! Gayle made a custom order for me. It is exactly what I had hoped, really beautiful. She listened to my request and communicated well. Thanks very much. This was beautifully crafted. I know that the receiver of this gift is going to love it! To make it even better, it shipped rather quickly too! Can you stamp on both sides? I use 22 gauge metal which leaves a slight impression on the back side when stamping. To accommodate requests for double sided stamping, I can solder a second piece to the back for an additional charge. Please contact me for more information. Will copper discolor my skin? Each of my copper pieces have a protective coating to prevent tarnishing and skin discoloration. Can I substitute sterling silver for copper? Yes, for most of my designs. Please contact me for more information.